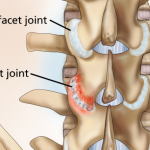 The cervical multifidus muscles insert onto the lower cervical facet capsules and the cervical facet joints are the source of pain in some chronic whiplash patients. The goal was to determine if the cervical multifidus muscles were active during a simulated rear-end collision and a loud acoustic stimulus, and thereby assess whether they can contribute to injuring the facet capsular ligaments during a whiplash exposure. 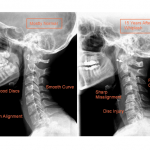 “The cervical facet joints are a source of neck pain in about half of chronic whiplash patients” (Lord et al, 1996a). In addition to guiding better diagnostic and treatment techniques (Lord et al., 1996b; McDonald et al., 1999), this finding provides an anatomical focus to biomechanical studies aimed at understanding the etiology of whiplash injuries. Pinching of the posterior synovial fold of the cervical facet capsular ligament is one possible injury mechanism (Kaneoka et al., 1999), but more attention has been devoted toward excess strain of the capsular ligament itself (Yoganadan et al., 1998; Winkelstein et al., 2000; Siegmund et al., 2000; Pearson et al., 2004). Injurious levels of strain have been observed in some capsular ligaments when loads simulating a rear-end collision are applied in-vitro (Siegmund et al., 2000; Pearson et al., 2004). Anatomically, the cervical facet capsule contains fine, unmyelinated nerves that likely have nociceptive function (McLain, 1994). Distending these ligaments by injection of contrast media has produced whiplash-like pain patterns in normal individuals (Dwyer et al., 1990). Tendons of the cervical multifidus muscles insert directly onto the capsular ligaments (Winkelstein et al., 2001; Anderson et al., 2005) and it has been postulated that multifidus activation during the neuromuscular response to a rear-end automobile impact could increase the strain in the capsular ligaments above that imposed passively by the impact-induced head and neck dynamics (Winkelstein et al., 2001; Siegmund et al., 2000). It remains unclear, however, if the multifidus muscles activate reflexively during a whiplash response. The neuromuscular response to a whiplash exposure contains both a postural and a startle response (Blouin et al., 2006a). This combined postural/startle response was observed in surface electromyograms of the sternocleidomastoid and cervical paraspinal muscles with and without the loud sound that accompanies a vehicle crash (Blouin et al., 2006a), although the muscle response amplitude was larger with the loud sound (Blouin et al., 2006b). These prior findings suggest that the startle response amplifies the neck muscle response and could increase the potential for a capsule-based whiplash injury. But because these prior studies used only surface recordings of muscle activity, it remains unclear whether the deep multifidus muscles are active during a startle response. The goal of this study was to measure the electromyographic (EMG) response of the cervical multifidus muscle during exposures to both a simulated rear-end collision and a loud acoustic stimulus capable of evoking a startle response. 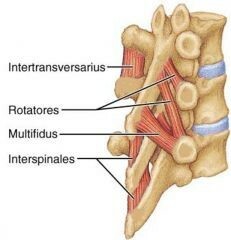 In summary, direct insertion of the multifidus muscle onto the cervical facet capsular ligaments provides a mechanism by which multifidus activation can exacerbate whiplash injury potential.